The Tivoli Marina Vilamoura commands an unspoilt waterfront setting, between the picturesque Vilamoura Marina and the golden beach. This Vilamoura hotel has long been a favourite with guests seeking luxury holidays at the heart of The Algarve. The hotel's plentiful onsite facilities, contemporary guest accommodation, and gourmet dining options also add to its appeal. The pool area takes centre stage during the daytime. Tucked away in lush gardens, the freeform pool is lined with sunbed filled terraces, making the perfect spot to top up your tan. Waterbased fun is on the menu for the children with their own pintsized pool alongside. If you prefer to feel the sand between your toes, the beach is just a few steps away. Keeping up the relaxing theme, the indulgent spa with its massage and beauty treatments is a great place to escape, as too is the nearby chilleout beach club area. The modern lobby area is light and airy and comes with contemporary seating areas and an adjoining coffee lounge. This stylish aura continues in the guest rooms and suites, all of which offer a plethora of modern touches that enhance your stay. Expect crisp white bedding, colourful throws and curtains, wooden furniture and comfy seating areas; together with air conditioning, an LCD satellite TV, mini bar, and internet connection. 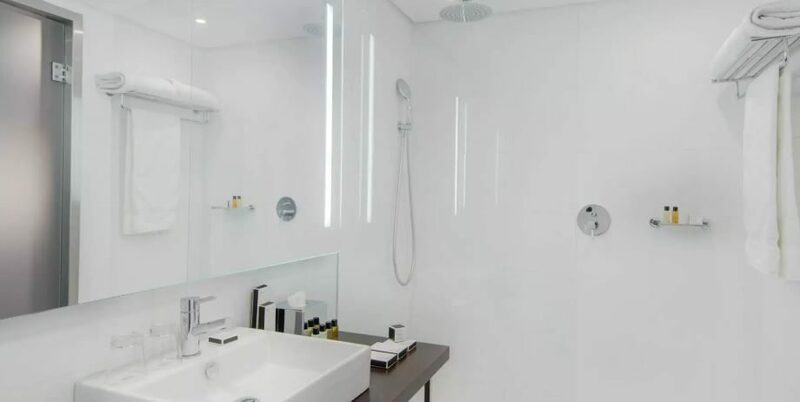 A modern bathroom and a furnished balcony complete the luxury feel. The bars and restaurants encompass tastes from around the world. 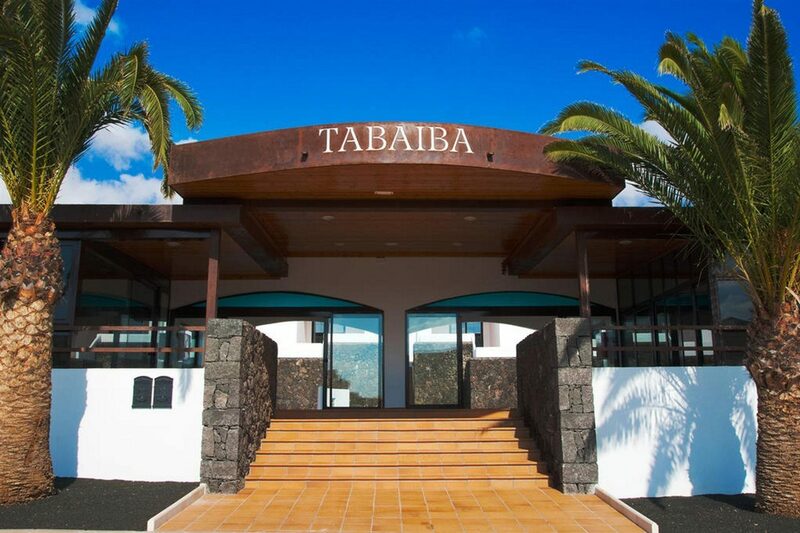 The main restaurant serves up Portuguese and continental buffet style cuisine three times daily. Grilled meat is top of the menu in the steakhouse, and the outdoor restaurant serves up a la carte dishes and lunchtime buffets. The trio of bars offer everything from al fresco drinks and stunning panoramic views, to live music and cocktails galore. The party continues at the lakeside club until late in the summer months. 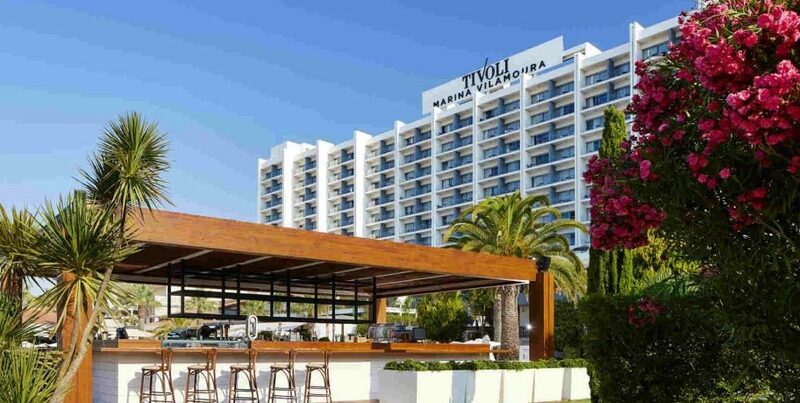 Discover why the Tivoli Marina Vilamoura is a popular place to stay for Portugal holidays. The Tivoli Marina Vilamoura has all the facilities you would expect from 5 Star holidays in The Algarve. Highlights include: A large outdoor swimming pool, sun terraces with sunbeds and parasols, children's pool, three restaurants, three bars, coffee, beach and lakeside terrace, 24 hour reception, 24 hour room service, 24 hour medical assistance, laundry service, shoe shine service, complimentary parking, excursion and transfer service, car rental, hairdresser, entertainment programme, tobacconist, shopping arcade, WiFi internet connection in public areas, floodlit tennis court, children's playroom, babysitting on request, and football training. The spa is open daily and offers 11 treatment rooms, Asian masseurs, sauna, Jacuzzi, Turkish Bath and gymnasium. The golf desk has special green fees at many of the 31 Algarve golf courses in the region, and there is also a 12hole putting green and a free shuttle bus service to the five local Vilamoura golf courses. This hotel in Vilamoura has a total of 383 modern guest rooms, consisting of 198 Deluxe Twin Rooms, 43 Deluxe Double Rooms, 103 Classic Twin Rooms, 18 Classic Double Rooms, Two Twin Rooms Adapted for Disabled Use, and 18 Junior Suites and three Suites. The Classic rooms feature individually controlled air conditioning, LCD TV with satellite and cable channels, video on demand, radio channels, hairdryer, direct dial telephone, voice mail, tea and coffee making facilities, Broadband Swisscom internet connection, complimentary safe, mini bar, two sofas, bathroom with toiletries, and balcony with sea or marina views. The Chilli Restaurant is open for breakfast, lunch and dinner and serves a mix of Portuguese and international cuisine with a garden view. The Menta Restaurant, which sits at the heart of the gardens, is open from 10.30am to 10.00pm and serves a lunchtime buffet and an a la carte menu. Pepper's Steakhouse Restaurant is open for dinner and serves a variety of meats with accompanying sauces and dressings. The Chocolate Bar is open from 10.30am to 7.30pm for a selection of hot beverages. Canela Bar offers panoramic marina views and is open from 7.00pm to 1.00am for drinks and live music. The Acucar Bar is situated by the pool and is open from 10.30am to 7.00pm for refreshments. The Side Bar has an open air terrace with marina views and is open from 10.30am to 1.00am for all your hot and cold beverage needs. Purobeach Vilamoura blends a restaurant and lounge bar with a Tai Chi and massage area, with the beach area open from 9am to 9pm and the lakeside area open from June to August from 7pm to 12 midnight, with party time from 10.30pm to 3.00am.